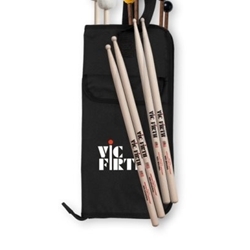 Designed to include the correct tools for producing quality sound at the student level, the Vic Firth Education Packs were developed with a "step up" approach. As the student advances from beginner to intermediate, he or she will acquire the essentials for band and orchestra literature. The EP2 contains a Vic Firth stick bag equipped with a pair of SD2 Bolero Drumsticks, M3 Medium Keyboard Mallets, M6 1" Hard Phenolic Mallets, and T3 Timpani Mallets.